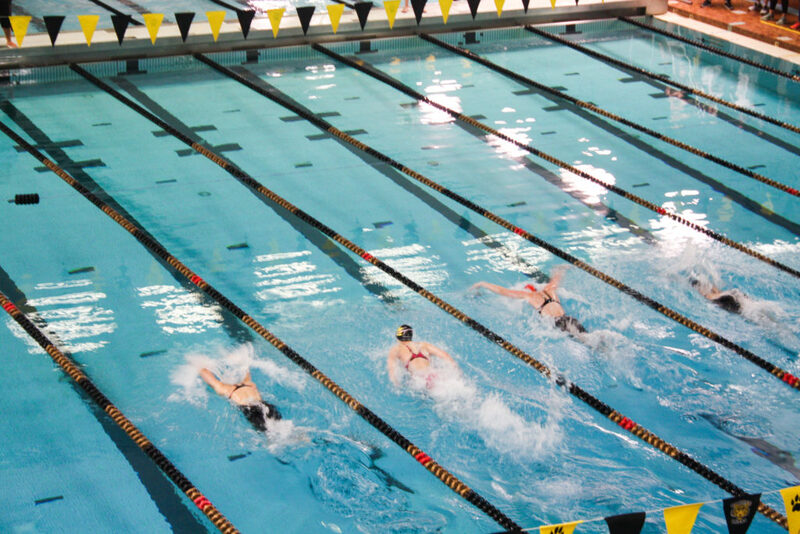 Dalhousie University’s women’s swim team continues to dominate. Winning every meet they’ve been in this season by significant margins, they’re poised to improve on last year’s ninth-place finish at nationals. “Looking at a much more motivated and stronger training team this year, we’re going to be doing a lot better at U Sports,” says fourth-year Lise Cinq-Mars. Most recently, at the Kemp-Fry Invitational, the women out-swam the higher-ranked McGill University team. Several Dal swimmers qualified for nationals in a slew of events. The Kemp-Fry Invitational. Photo by Josh Young. Cinq-Mars, Claire Yurkovich, Isabel Sarty and Reagan Crowell set a new AUS and Dalhousie record in the 400m freestyle relay with a time of 3:49:18, and Sarty also set a new AUS record in the 100m freestyle with a time of 55:66. They’re now ranked eighth in the country for the week of Nov.13-20. Last year, the women’s team won the AUS conference championship for the 17th year in a row. They also swam to a ninth place finish at nationals with five swimmers. They’re on pace to do better this season. They have a good core group: four of the five U Sports qualifiers from last year returned this year. That includes AUS Swimmer of the Year Lise Cinq-Mars and second-year freestyle specialist Isabel Sarty, who was the top-scoring AUS swimmer at the U Sports championships last year. With all their returning swimmers, half of the team is third year or older. “We have some really good leadership,” says Cinq-Mars. That leadership is important, she says, to show younger swimmers what university competition is like. There are five rookies on the team. That rookie group is already contributing to the team’s success. First-year Reagan Crowell has qualified for U Sports as part of the 400m and 800m freestyle relays. “She’s brought a ton,” says Yurkovich. Also on the team this year is Olivia Feschuk, who is in her final year after competing with Mount Allison University for four years. She’s qualified for nationals in the 50m butterfly and 200m IM. They’re hoping to have more people qualify for U Sports. Right now they have five— Cinq-Mars, Yurkovich, Sarty, Feschuk, and Crowell—which is a good point to be at for this point in the season. “We’re on the right track,” says Cinq-Mars. They still have several opportunities to get more qualifiers. The team races again in January at the Dalhousie Invitational meet, and then at AUS Championships in February, hosted by Dal, before the swimmers who have qualified for nationals head off to the U Sports Championships at the University of British Columbia. Before then, they’ll head to Florida for training camp over the winter break. If they keep up the momentum from their first half of the season, the Tigers women’s swim team seems poised to improve from last year.